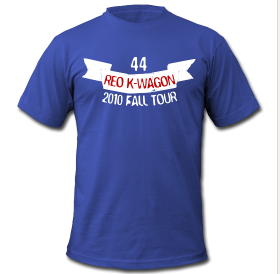 Oh, and if you don't know what REO K-Wagon means, it's a nickname I gave Roy Edward Oswalt when he was acquired by the Phils. 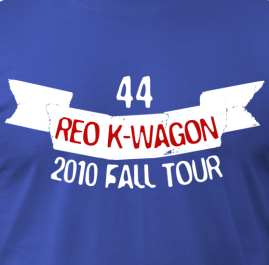 You see, there was this band called REO Speedw--oh, hell with it. If I have to keep explaining it, you probably weren't going to buy the t-shirt anyway. from one drunk ZWR groupie to another, i agree, this is magic. excellent shirt. really, really good. combines my two favorite things: rock and roll and facebreaking phillies. REO Speedwagon (the actual band) is playing on the last Sunday (Braves vs. Phils) of the season at Turner Field after the game. Wouldn't it be something if Oswalt won the game to take the division too? This is by far the best shirt you've done, ZWR. How much for postage to UK? I'm disappointed that this is the only post that falls under the search category of "DRUNK T-SHIRT DESIGNING"